Did you participate in the low-carb craze of the 90’s? If you did, you may have eaten a lot of spaghetti squash with tomato sauce trying to convince your carb-starved body that you were actually eating pasta. The body is no fool, though. At least mine isn’t. I ate lots of “spaghetti” for a good year, but never really felt like I was eating pasta and then I had a negative association with this pasta imposter. The better attitude to take is to acknowledge that spaghetti squash is a delicious food unto itself and that replacing a processed food (pasta) with something whole and full of vitamins and minerals is a fantastic idea. I had sworn off spaghetti squash for 15 years because I thought the only way to eat it was with marinara sauce and I had O.D.’d on that. But my lovely summer intern, Hannah, had found this recipe that sparked my interest and I was back. 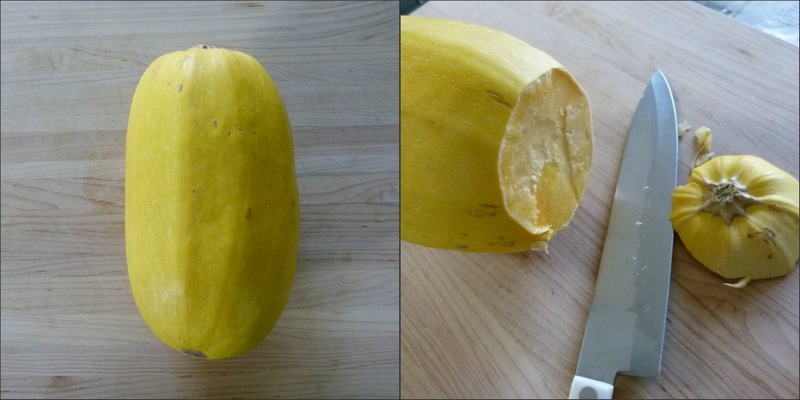 Spaghetti squash comes into season in the early fall and lasts through the early spring. Like most winter squashes, spaghetti squash lasts quite a while off the vine without losing nutrients. In fact, many winter squashes actually get a little sweeter when they’ve been allowed to “cure” on your countertop for a bit. What is unique about spaghetti squash is that the flesh is not meaty like other winter squashes like butternut squash or pumpkin, for example, but instead stringy after it has been cooked. It resembles spaghetti strands when you rake your fork through the flesh. Pretty cool, actually. The flavor of spaghetti squash is like the glass half empty-glass half full. It has a very subtle flavor — really subtle — which means it tastes kind of bland, but it also means you’re not that limited with flavors you can use. Funny enough, the trickiest part about cooking spaghetti squash is actually cutting it open. I have tried numerous methods and the one that is hands-down the best is what I call the slot machine method. You can see from the photos that I insert the tip of my big, sturdy chef’s knife into the flesh of the squash a few inches from the bottom and pull down. 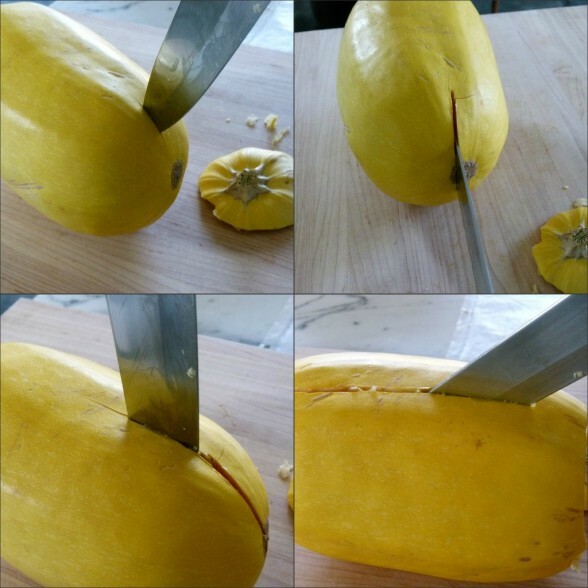 Then I inch my way up the squash towards the middle and keep inserting and pulling down the knife. This is the safest and easiest way to do it. If you don’t want to try cutting it open and you have extra time, you can pierce the squash a few times with the tip of your knife so it doesn’t explode in the oven (ask me how I know this) and roast it whole. This way it will soften up and be much easier to cut open, but you’re adding an extra 15-20 minutes to the cook time. I prefer to roast the squash halves, which takes about 45 minutes. You can also plunge the halves into a pot of boiling water for about 13 minutes if you’re in a rush, but I think you lose nutrients when you boil vegetables for a long time like that. Also, it’s easier to overcook it and then the subtle flavor becomes even more subtle (as in, it tastes like water.) I’m well aware that people also microwave spaghetti squash halves, but this is a site about NOT microwaving food, so you’ll have to figure that one out on your own. Preheat oven to 400 degrees. Cut the spaghetti squash in half lengthwise and remove the seeds. Rub the inside of each half with a drizzle of olive oil and season with salt and freshly ground black pepper. Arrange cut-side down on a parchment-lined baking sheet and bake for 45 minutes until tender. Heat oil in a large skillet over medium. Add garlic and cook until fragrant, about 1 minute or less. Add chili flakes, stir for a few seconds and add chopped kale with a few pinches of sea salt. Sauté kale until the leaves are bright green, about 5 minutes. Add the chickpeas and cook until warmed through. Remove from heat. Remove squash from oven when it is cooked through and tender. 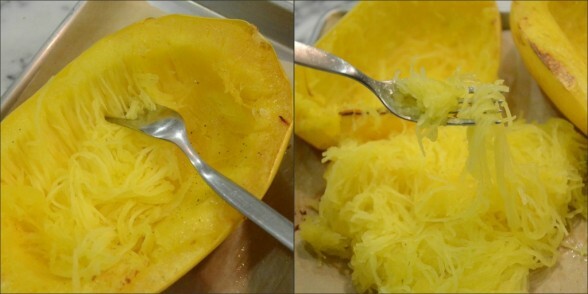 Using a fork, pull the strands of squash from the peel so that it resembles…spaghetti! 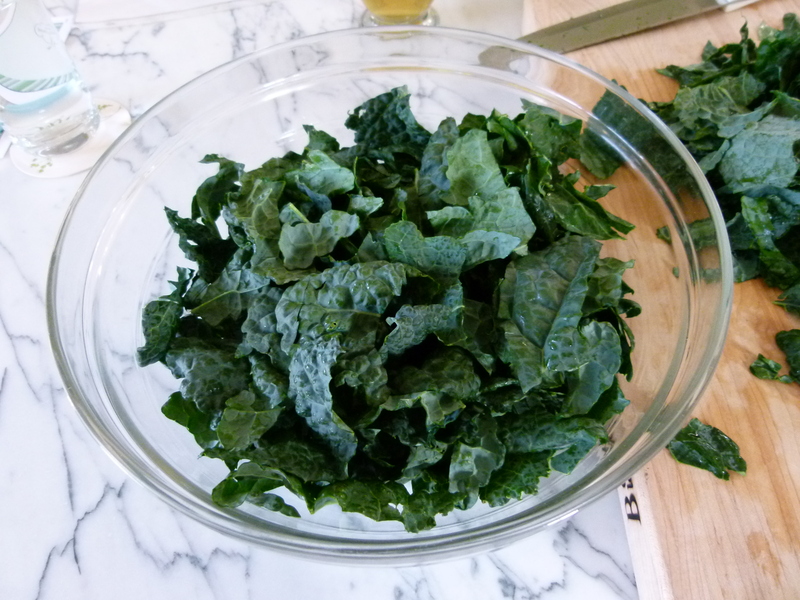 Place the strands into a serving bowl and add the kale-chickpea mixture. 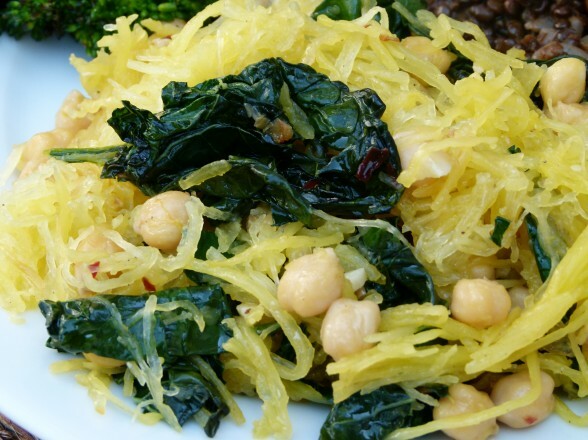 If you do the spaghetti squash in advance and it is no longer hot, add to the kale and chickpeas and sauté over medium heat until warmed through. Toss to combine and taste for seasoning. Since spaghetti squash is rather bland, you will need to add plenty of salt and pepper. Garnish with cheese if desired. Love this recipe! So easy to make! I’m going to make an extra spaghetti squash next time for “squash bowls” like you suggested next time since it heats up so well! Definitely! You can make your spaghetti squash the day before and then you have a practically instant, nutritious dinner the next day. Brilliant recipe, Pamela. The whole family loved it. Only changes were: 1 diced onion and 2 slices of minced nitrate-free bacon..and, in addition to kale, also used rainbow chard. So tasty …and I cooked the squash last night, so the dish came together quickly when I got home from work. I love all those changes, Lilian. Thank you so much for sharing! If I use canned chickpeas, do I rinse them before using? Any idea of how well this freezes/ tastes after thawing? I haven’t tried freezing it Tanya, but my guess is that the texture of the squash would suffer and that it would be soggy. Just tried this tonight. Best spaghetti squash I’ve ever had. Tossed some shrimp in and it was delicious. Will definitely be making this again. I’m so glad you enjoyed it! The first time I made this I ate practically the entire pan standing over the stove. Adding shrimp is a good thought — I like that! Thanks to my dear friend, Rafaela, and this wonderful recipe, I have overcome my childhood spaghetti squash trauma. Honestly, this is the last thing I thought I would ever love, but it is delicious. Thanks for opening a closed door Pamela! What a sweet comment, Ruth. Thank you. So happy to bring you and spaghetti squash back together! This was SO delicious and a huge hit!!! Very satisfying. Thank you!!!!! How did the roasted cauliflower version turn out?? Sounds delicious! My daughter used broccoli and it was fabulous, although I imagine roasted cauliflower would be terrific, too. Perhaps with raisins and pine nuts added? I write it like I see it! I made this and I really enjoyed it. I used a bit more salt and omitted the chickpeas, which my husband and I don’t enjoy. I used the kale, which I love, and added shrimp(!). It was great. And really easy. Will do again. Thank you Pamela! Great feedback, Jenny. I’m glad your brought up the salt because spaghetti squash needs quite a bit. I imagine the shrimp would be delicious here — you could even do a take on shrimp scampi. I’ve made it with fresh spinach, too. I have also added pan-seared (or grilled) chicken and apple sausage, chopped into chunks to make it a one dish meal. 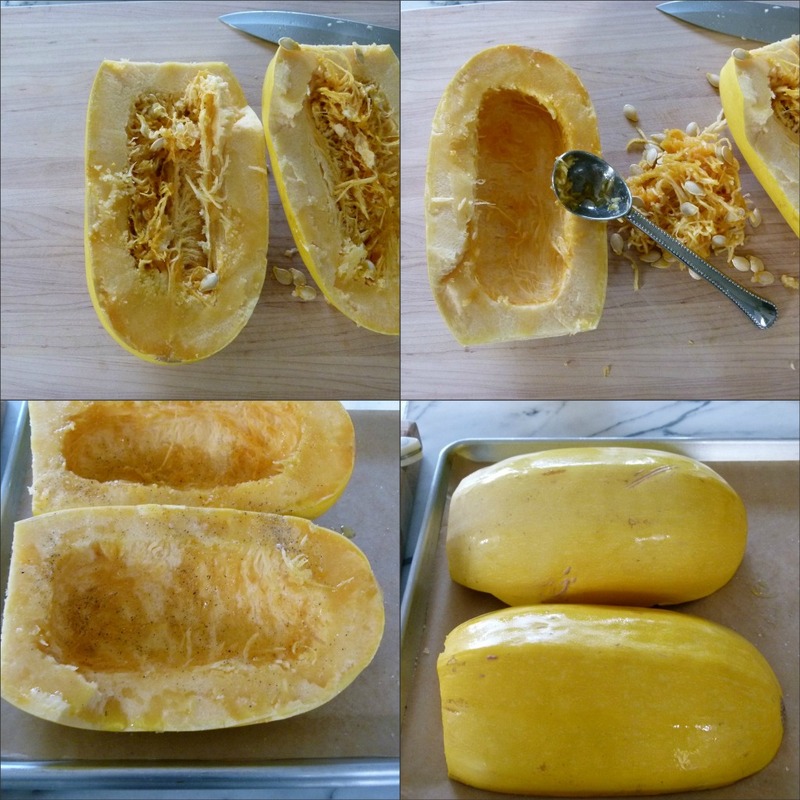 I, too, used to hate spaghetti squash… until now!!! Even better the next day! It’s pretty filling, I think. Easy for it to be a one-dish meal! This is my new favorite recipe! I make it every week just to keep in the fridge for my lunch. I tried spaghetti squash in the past but it was AWFUL with tomato sauce on it. I always wondered why everyone liked it so much…Until I tried this version. Yummy! I love it with a sprinkle of parmesan cheese. The flavor is so mild and great. I finally (after 5 times of trying to cut the squash I put in the microwave for 3 minutes to soften) was able to cut through the squash! No kidding, those things are hard to cut, but do try my method above. I used a sturdy 8-inch chef’s knife. 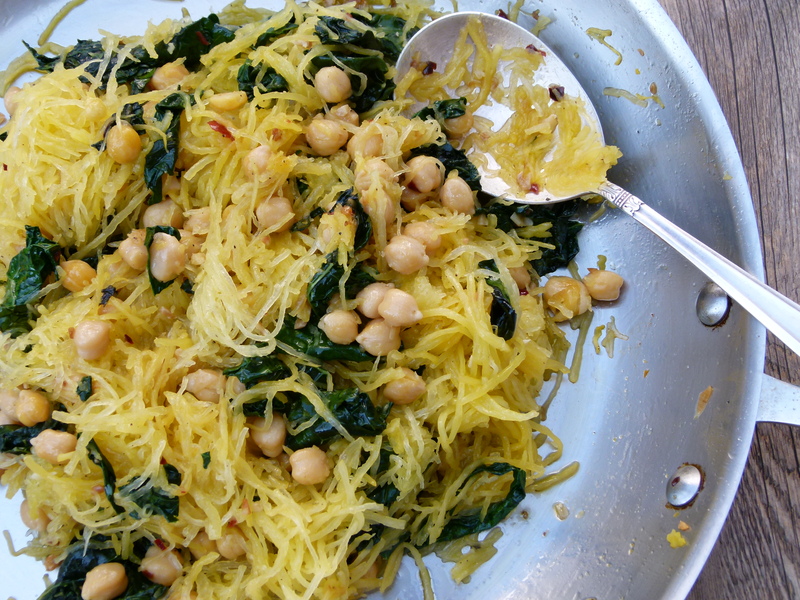 I am making spaghetti squash again tonight with roasted cauliflower, pine nuts, currants and spinach. SO excited! I’m eating left overs from last night of this right now! I threw in some tomatoes and spinach to turn it into a salad. Yum! Never thought to turn it into a salad!! Huh!